Have you seen this pop-up, or one very similar to it? Did you click it? Like so many other companies, we will NEVER have a giveaway that is done by using a pop-up on the internet. Any giveaway we might do will be announced on our webpage and our social media sites. 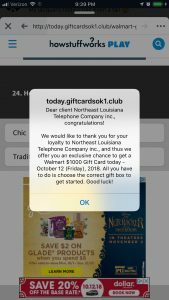 It would only take a few seconds to verify that a giveaway is legitimate by visiting a company homepage and it would avoid a LOT of frustration, especially if the popup link contains a virus or some other bit of nastiness.